By all the accounts I've seen over the past few days, Black Friday wasn't nearly as impressive as it has been in previous years. Most people seem to place the "blame" for that on online shopping. Online sales on Thanksgiving were 25% higher than last year. Most people talk to the growing scope of holiday shopping, with early holiday sales and promotions creeping now into early October, but less mentioned is the increasing ubiquity of smart phones. During Thursday and Friday of last week, between 1/3 and 1/2 of traffic to online shopping sites was done on a mobile device. There are multiple reasons for that. First, more people are getting smart phones and second, more people are becoming comfortable with the security on smart phones. There used to be a fear of hackers stealing your credit card number out of the air if you were using wi-fi or a cell phone signal, but I think we've gotten enough news reports over the years pointing out that it's more likely to be stolen from the database of the company you purchased something from (Amazon, Target, etc.) that users are a little more inclined to use their phones to make purchases. Although it should be noted that conversion rates on phones are still far lower than those from desktop machines, so it's not like that fear has been completed eliminated. Now, interestingly, Cyber Monday basically started because people would do what shopping they could over the Thanksgiving weekend at brick and mortar locations, and then waited until Monday to shop online because they had a faster internet connection in their office at work. But with higher connection speeds becoming more common AND the ubiquity of cell phones with their relatively high speeds AND the accessibility of more sites on smaller devices (which allows users to casually and easily browse while they're watching the football game or riding public transportation back home) AND advanced holiday promotions beginning well before Thanksgiving, that all suggests to me that Cyber Monday won't be nearly as long-lived as Black Friday has been. I'm sure it will continue to be around for awhile, but I suspect we'll be seeing that sales bump plateau sooner rather than later. More shoppers on cell phones means a greater need to ensure your website is responsively designed -- that is, it should look good and be easily navigable whether a user is using a desktop, a tablet, a phone, or whatever. 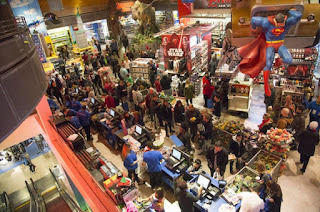 Black Friday remains the bastion of big box stores. In order to take advantage of holiday shopping, smaller retailers (like comic book shops) should work to make some materials available online. A Facebook page with just a map and store hours may work well enough for day-to-day business, but any hope for additional sales in/around Thanksgiving are almost shot if you don't have something available for sale online. Promotions, as noted above, are well into October now. Waiting until a few days before Thanksgiving to start promoting your shop and/or any holiday sales you might have planned is too late. This all goes for both your "traditional" local comic shops, and webcomikers who are trying to sell some of their goods online. I know many of both groups didn't really get into their businesses with a firm understanding of the marketing side of business practices, and while I'm only making some projections here based on what I know (which is certainly more limited than a lot of other people in a lot ways) it would undoubtedly behoove anyone in comics trying to take advantage of the holiday shopping season to pay attention to trends and learn as much as they can.